Tomato Cucumber Salad is just the type of dish I resolved to include with our daily meals this year. I decided we would take common ingredients such as tomato and cucumber and give them an international flare. Why stick with our balsamic vinegar and olive oil? Why not make it Mediterranean and use yogurt as a base and then give it a kick by adding a touch of ginger, garlic, and hot pepper? 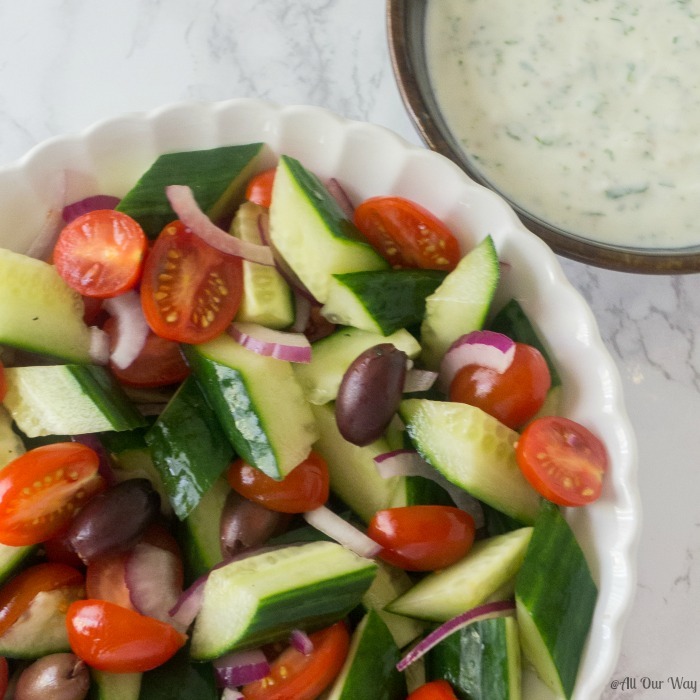 Mediterranean Tomato Cucumber Salad and Yogurt Dressing is our start on this New Year’s resolution. That saying was one of my mamma’s favorites. We start with a clean slate, a new beginning, a new life. Did you make a New Year’s resolution? I hate to admit this, but usually, I make one and forget about it, continuing with old habits. Now, my habits aren’t all bad. I admit, one or two could stand improvement, especially when it comes to being organized. 😉 Oh, and remembering lists. I make lists, and then when I leave, I forget them on the kitchen counter. Do you do that? It frustrates Honey to no end! Do you make lists? One of my favorite sayings is: fail to prepare; prepare to fail. Not that I follow that advice. 🙁 So this will be the year of lists and preparation. Preparing menus ahead of time and making sure I have all the ingredients for a dish such as the one for the tomato cucumber salad. 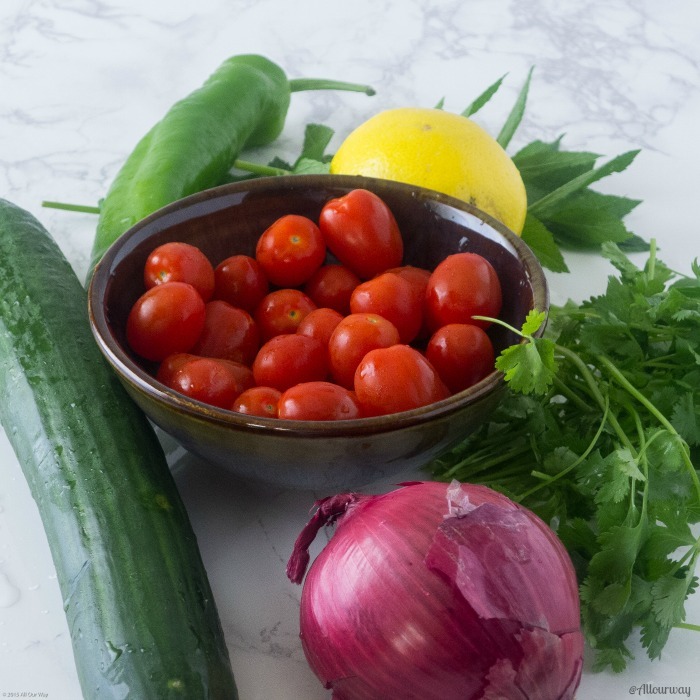 The main ingredients are simple: English-style cucumbers, grape or cherry tomatoes, and red onion. It sounds almost too easy, doesn’t it? Are you wondering why I would start a year with something that appears quite, well, ordinary? It’s the sauce. Thick. Creamy. Spicy. A satisfying combination of tzatziki and raita sauce, using the unique ingredients of each. Why didn’t we just stick with either a Greek version, tzatziki, or Indian version, raita? “I’m in the mood for something spicier,” said Honey. “Why can’t we just make the base as a tzatziki and then just add the other spices?” he asked. Like I could ever forget the olives in his salad. Honey did have a point, though. I’ve been known to forget about a few things in the veggie drawer, and that is one of his pet peeves — wasting food. It was also my mamma and papà’s and mine too, but when I’m in the veggie aisle, I see so much potential. The result was delicious. The sauce was outstanding, and the additional spicy ingredients in the yogurt dressing made the Mediterranean Tomato Cucumber Salad excellent. This recipe is a keeper. We hope you sign up for our weekly newsletter and follow what we’re up to in and out of the kitchen. We enjoy sharing our adventures in cooking with you. A simple salad that gets its flavors from the rich, creamy yogurt sauce. 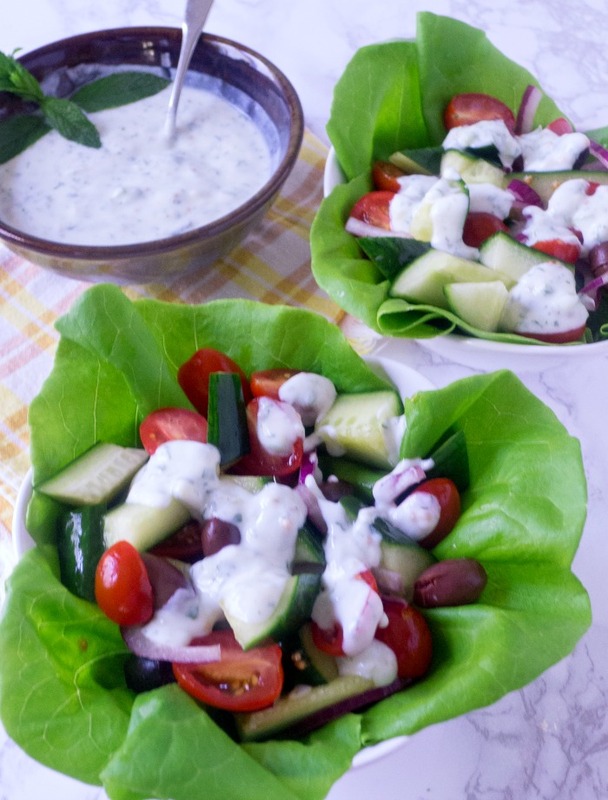 A wonderful combination of Greek tzatziki and Indian raita. 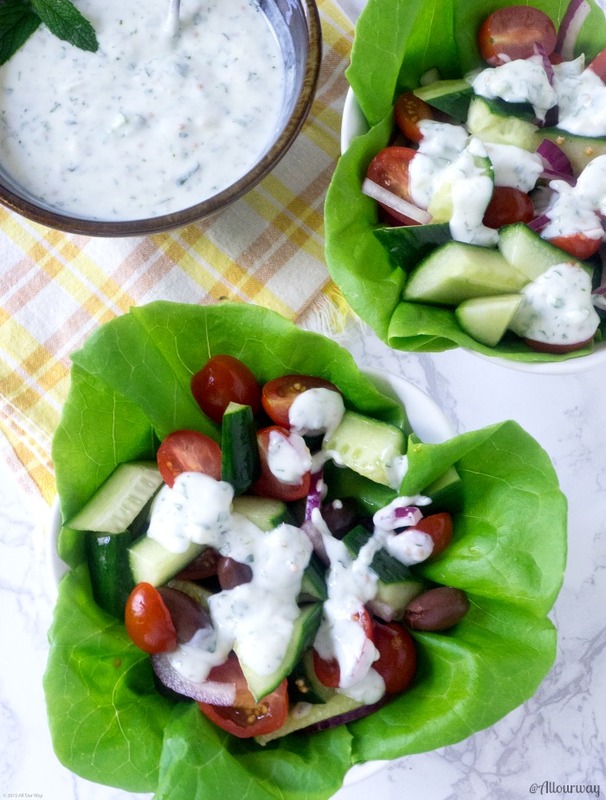 Serve the tomato cucumber salad in a Buttercrunch lettuce bowl. 1 head Butter Bibb, or Boston lettuce washed and patted dry with paper towels. Make the dressing by scooping the yogurt into a medium bowl and using a fine grater, grate the garlic and ginger over the yogurt. Stir in the sugar, lemon, poblano, cumin seeds, half the mint and cilantro. Season to taste. Set aside until ready to serve the salad. Cut the cucumbers in half lengthwise, then each half three more times into long wedged-shaped pieces -- 8 long pieces. Cut them into 1 to 1 1/2 inch lengths on a diagonal and add them to a big bowl. Pile the tomatoes, onions, and kalamata olives on top. When you're ready to eat, mix some of the dressing with the salad. Sprinkle with remaining mint and cilantro. Make lettuce cups with your choice of green and spoon a healthy portion into the center of the lettuce cup. Serve with the extra yogurt dressing on the side. Adapted from Smitten Kitchen's Cucumber Yogurt Raita Salad. Note: Recipes and content from © 2017 All Our Way is copyright protected. Please do not use content or recipe without prior written permission. If you want to share this information, please link to this post. Grazie. Love how simple this recipe is. Easy to make, yet so delicious. Even a novice cook (like my daughter) can whip up this salad…and impress their dinner guests. I will be passing this along…and hopefully one day either one of them will bring it to a family function LOL!! I am in love with this recipe! I just ate a tomato cucumber salad today…but SO wish I had that dressing to go with it. 😉 Thanks for sharing! It is good, isn’t it? You’ll have to make your own dressing, Sammi. Hi, Jenna! If the bread is homemade or the Artisan variety it has no calories. 😉 The good for you cucumber tomato salad soaks up the calories!! Italians can always find an excuse to eat good bread. This would be great with some chicken and this light side to for a ‘eat light’ night. Yum! Hi, Erin. It would be great with chicken. You could even add some feta if you want to add the cheese but we thought to keep it light. 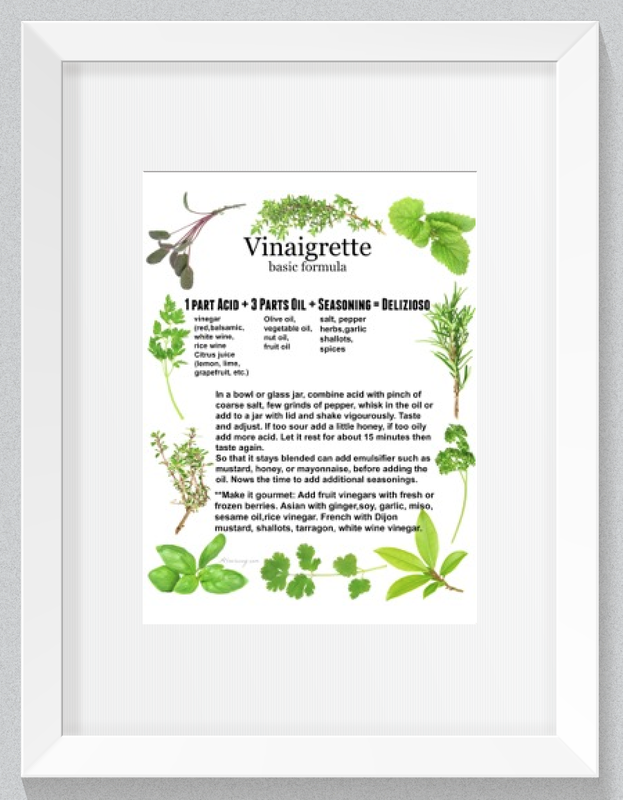 Ive been looking for more clean recipes… this totally fits my needs! Pinned! Hi, Michelle! Hubby and I are also trying to fit in more veggies and this certainly is a good way. Thank you, Mimi! Hope you have a wonderful day! Ha – Funny but I think you made a good compromise. I need to eat more salads too with the new year. This will be my springboard. It’s a good thing we like salad because we’ll be eating lots of it but we aren’t giving up our good Italian food. 🙂 Have a good weekend, Linda. I love raita and this looks just as yummy! This is something I’ll definitely make for my husband this Summer, I think he would love it! Hi, Carissa! I know you’ll enjoy it! Let me know how you like it. You’re welcome, Susie! Your big brother sure did like it. xoxo back at you! I love Mediterranean food and this is a great example of such a cuisine. Looks so delicious and refreshing. Thank you, Jovina! Plan on making it again soon. Um, what resolutions?? Oh yeah, I think I made some, I forgot, LOL! (I also forget about the food in the veggie drawer too, ha! I can’t wait to have this salad. I LOVE the sound of this dressing. Hubby will like it too. I’m really trying to plan ahead and eat a little healthier this year. And this will be a good start, thanks for the recipe! Hi, Elizabeth! I don’t make resolutions too often — my memory isn’t that good. I remember once my resolution was not to talk about people — gossip type stuff. I no sooner made the resolution and told my hubby when I said, “Guess what so and so did?” Hubby just grinned. I mean sometimes making resolutions just sets us up for failure, don’t you think? Something like . . . I’ll eat every day is a good resolution.